Out of the box, Bellows will expand to fill the container you place it in. This is so that you can wrap Bellows inside of a grid column within your theme layout, and it’ll react appropriately within the theme’s responsive layout. If you’re using such a strategy, you don’t need to adjust these settings. However, the following settings allow you to set an alignment other than full width, and an explicit width for the menu, if you so choose. Note that by setting an alignment and width, the layout becomes more brittle. Allowing the menu to remain full width inside a responsive container is the most flexible way to add the menu to your layout, and is the recommended solution. The menu alignment setting controls the position of the menu within its container. 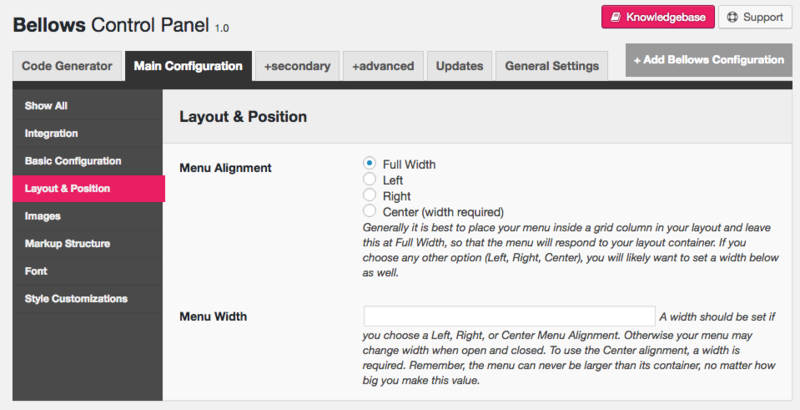 You can align it to the left edge, right edge, full width, or center the menu (by setting a width as well). Note that this is all relative to the theme’s container element. The plugin cannot control the position of the menu relative to anything else on the site, only the element that you place it inside of. The menu width parameter should be used if you are using a menu alignment other than full width. This ensures that your menu remains a consistent width when submenus are opened.